Please be sure to arrive between 6:00 pm and 6:15 pm. Game starts at 6:30 pm. RSVP to the Chamber of Commerce 10 days prior to the event. 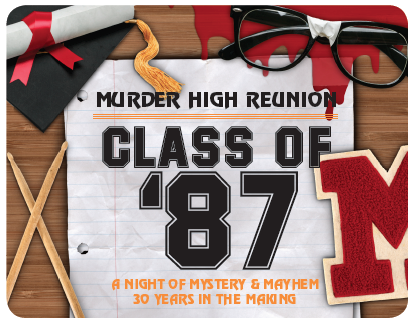 *Must be 18 years or older in order to attend a Murder Mystery Dinner. 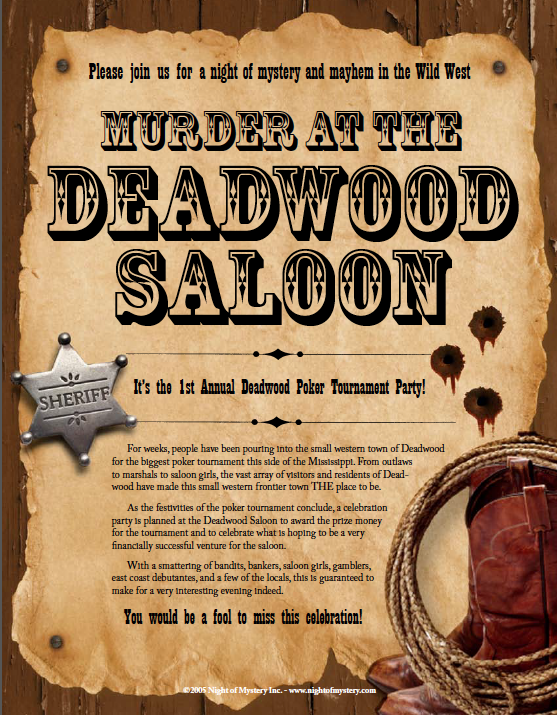 As the festivities of the poker tournament conclude, a celebration arty is planned at the Deadwood Saloon to award the prize money for the tournament and to celebrate what is hoping to be a very financially successful venture for the saloon. With a smattering of bandits, bankers, saloon girls, sheriffs, gamblers, east coast debutantes, and of course a few locals, this will make for a very interesting evening indeed. Salad, Braised Chicken and Brisket, Mashed Potatoes, Green Beans & Dessert. Please contact Tours@atchisonkansas.net if you have any dietary needs. Whether this is your first murder-mystery experience or your 40th, each murder-mystery experience is different and has different rule pertaining. Here are some tips to review to help make sure the night as an unforgettable experience. Read your character sheet – This contains your identity and all the information you will need to play your part, including acting and dressing tips. Don’t reveal everything about your character – While there are many things that everyone needs to know about you, there are some things that should remain secret. Use your discretion as to not give too much away – you may find out at the party that you are the killer indeed! Dress the part – It’s a proven fact that the more into the character you are the easier it will be for you to truly enjoy all the aspects of the night. In addition, it adds to the excitement, the photo opps, and your chance to be voted best dressed. Please see nightofmystery.com for ideas on costumes. Review the Gazette – Included in your invite will be The Deadwood Gazette. Review this gazette for it includes background information (such as the other characters attending the party) that may come in useful the night of the party. Use your money creatively – Upon arrival, you will receive $500 to spend any way you choose. Bribery and blackmail are two of the most common uses we found (and highly encouraged). The wealthiest player at the end of the night will also receive an award for their ability to turn a profit throughout the night.